GR Engineering was appointed by Catalpa Resources Limited to undertake the engineering, design, procurement, construction and commissioning of the Edna May gold processing plant. Catalpa had previously procured the old Big Bell processing plant, equipment and infrastructure to meet most of the processing requirements. Additional equipment was required to meet the duty requirements of the upgraded processing plant. Part of the GR Engineering scope was to manage the refurbishment of this plant and incorporate it into the Edna May plant design. The plant is designed to treat an ore blend, at a throughput of 2,800,000 tpa. The grinding and wet plant circuits are designed to process ore at a treatment rate of 340 tpa. The plant is designed with provision for an expansion in processing capacity to 3,200,000 tpa. Blended ore is processed through a conventional single stage jaw crushing circuit. Crushed ore is stored on a coarse ore stockpile with a live capacity of approximately 3,800 tonnes. The grinding circuit consists of a primary SAG mill, secondary ball mill and pebble crushing circuit. Gold recovery consists of both a gravity circuit containing gravity concentrator and intensive cyanidation units and a hybrid CIP/CIL circuit, consisting of 2 leach and 6 adsorption vessels. Loaded carbon is stripped of gold using a pressure Zadra type elution circuit and gold will be subsequently recovered from the cathodes of the gravity and elution electrowinning cells. GR Engineering commenced the EPC design, construction and refurbishment of the process plant facilities in May 2009 and the project was completed in May 2010. 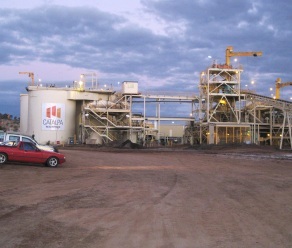 Subsequent to the completion of the Edna May gold processing plant, GR Engineering has undertaken a capacity upgrade facilitated by the supply, installation and commissioning of a second hand, 24m diameter tailings thickener to assist with water recovery, design and installation of a fuel farm and the design and implementation of various plant improvement and debottlenecking projects. GR Engineering Services have received a "Letter of Conditional Award" from Catalpa Resources Limited enabling GRES to commence project works for the Edna May Operations. GR Engineering Services provided with Letter of Intent to enter into a supply agreement to refurbish and construct the Big Bell processing facility on site at its Edna May Gold Project near Westonia in Western Australia. Location The project is located 1.0 km north of Westonia (312 km east of Perth) in Western Australia.